I would very much appreciate your feedback on the current state. Please let me know if you are interested in seeing this project continued! Note: 1) This is ALPHA, many features are incomplete, fundamental things might change, etc! 2) The animation part is not yet fully released (I'm working on it). 3) There is a long list with things that I still would like to implement. - Use right and left mouse on the background to change the camera. - If you have problems, please close the program, delete the "settings/pref.ser" file and start the program again. - "'javaw' is not recognized as an internal or external command, operable program or batch file." (Windows) - Check that your windows has java 7 installed. If java 7 is installed, please try "start-jre7.cmd". Holding control or alt will now always enable the free view, no matter which tool you are using. Note: Holding control will not work on MAC (there is nothing I can do about that). Shift + Right Click: As left click, but also sets the rotation point of the main view to the clicked voxel. You can reset the rotation point in the toolbar of the main view. Left Click: Fill all attached voxels with the same color with the selected color. 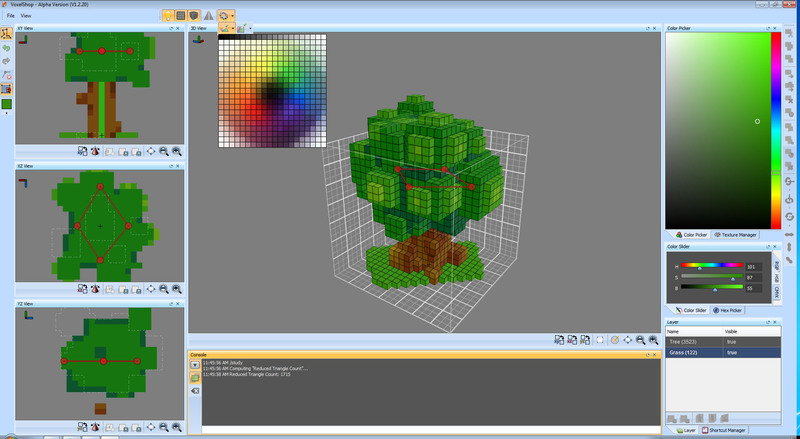 Right Click: Fill all attached voxels with the same color and in the selected layer with the selected color. Shift + Left Click: Fill all voxels with the same color with the selected color. Shift + Right Click: Fill all voxels with the same color and in the selected layer with the selected color. Left Click: Change the color/texture of the clicked voxel. If the texture is already the selected one for the clicked side of the voxel, is is rotated. Right Click: Change the color/texture of the clicked voxel if the voxel is in the selected layer. If the texture is already the selected one for the clicked side of the voxel, is is mirrored (it doesn't matter if the voxel is in the selected layer in this case). Shift + Left Click: Draw out an area to set the color/texture of all voxels in that area. Shift + Right Click: Like left click, but only considers voxels in the selected layer. - Use WASD to move between colors. [...] Will update this as questions pop up.